In December 1955, a young Montgomery woman named Rosa Parks was arrested for refusing to relinquish her bus seat to a white man. Local pastors rallied the black community for a city-wide bus boycott, named themselves the Montgomery Improvement Association, and unanimously elected King as president. When a year later the boycott succeeded in ending bus discrimination, King was propelled into the national limelight. In 1957 he helped found the Southern Christian Leadership Conference (SCLC), an umbrella for civil rights organizations. The next year, he published his first of seven books, Stride Toward Freedom. In 1959 King moved to Atlanta to become co-pastor with his father at Ebenezer Baptist Church. The next years saw him organizing peaceful demonstrations in Atlanta (1960), Albany (Georgia, 1961), Birmingham (1963), St. Augustine (Florida, 1964), and Selma (1965). King received death threats, was once stoned, was arrested several times and held in solitary confinement. In addition, after King criticized the FBI in 1964 for cooperating with segregation authorities, the FBI stepped up its surveillance of King. A mixture of politics and personal animosity prompted FBI chief J. Edgar Hoover to try to discredit King as a womanizer and communist. There was, unfortunately, substance to the first charge but not the second (the most that can be said is that King’s early advisers had formerly been members of the Communist Party). Hoover called King “the most notorious liar in the country,” and the FBI went so far as to send a letter to King suggesting he commit suicide. King became increasingly troubled with the dichotomy between his private and public selves, and the burden of leading the SCLC often seemed overwhelming. But his preaching continued to inspire his followers. His greatest oratorical moment came on August 28, 1963, when 250,000 demonstrators gathered at the Lincoln Memorial in Washington, D. C. All speakers had their speeches pre-approved, but in King’s original, the now-famous phrase, “I have a dream,” never appeared. King was the last speaker of the long, hot day. He noted the fatigued state of his audience, and he remembered a phrase he’d heard spoken by a young women who had some months earlier led a service at the remains of a torched church. "I have a dream,” he began, “that one day on the red hills of Georgia, sons of former slaves and sons of former slave-owners will be able to sit down together at the table of brotherhood. . . . In 1964, at the height of his influence, King became Time magazine’s first black “Man of the Year,” then the youngest person ever to win the Nobel Peace Prize. He donated the prize money ($54,600) to civil rights organizations. In spring of 1968, King was in Memphis to help with a sanitation strike. On April 3, he told his audience, “I may not get there with you, but I want you to know that tonight that we as a people will get to the promised land.” The following day, James Earl Ray shot and killed King as he stood on the balcony of the Lorraine Motel. The nation mourned King’s death, and the civil rights movement fragmented irreversibly. King’s influence may have waned in the last two years of his life, but 20 years after his death, his legacy was deemed so crucial to the nation’s history that a national holiday was named after him. I sat there and thought about a beautiful little daughter who had just been born. . . . She was the darling of my life. I’d come in night after night and see that little gentle smile. And I sat at that table thinking about that little girl and thinking about the fact that she could be taken away from me any minute. And I started thinking about a dedicated, devoted, and loyal wife, who was over there asleep. And she could be taken from me, or I could be taken from her. And I got to the point that I couldn’t take it any longer. I was weak. . . .
And it seemed at that moment that I could hear an inner voice saying to me, “Martin Luther, stand up for righteousness. Stand up for justice. Stand up for truth. And lo I will be with you, even until the end of the world. . . . ” Almost at once my fears began to go. My uncertainty disappeared. Russel Moldovan is pastor of Blanchard (Pennsylvania) Church of Christ, and author of Martin Luther King, Jr.: A History of His Religious Witness and His Life (American Universities Press). 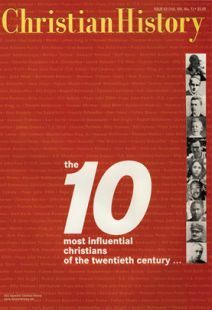 How the ten most influential were selected.